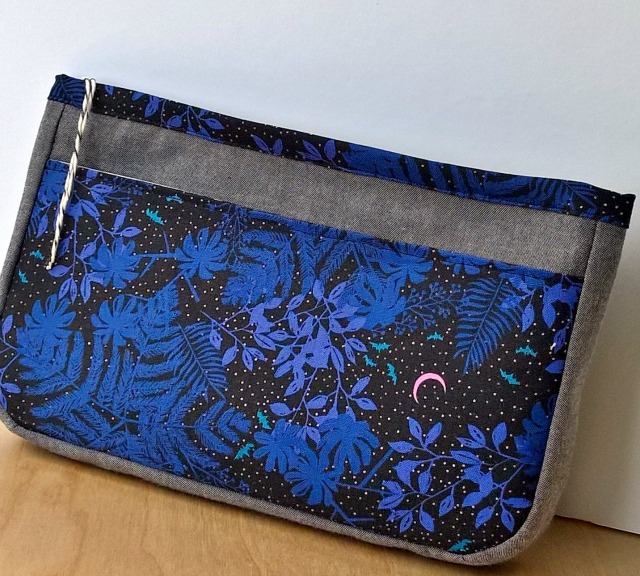 When I was looking to make a pouch to coordinate with my mom's new bag, I hopped right on over to s.o.t.a.k handmade to see what Svetlana had that I hadn't tried yet. There I happened upon the sophia pouch, and I can now say it's a new favorite. For 5"x8", this pouch has plenty of extras - a roomy exterior pocket with velco closure, an interior pocket, plus a 1" gusset that allows for extra space. And the pouch has what I consider Svetlana's signature zipper technique, which personally I like alot, and which you'll also find on her lola pouch. Though the pattern calls for piping, I went without this time, but it's definitely another nice design element. Fabric-wise, I believe the 'main' fabric I used was a chambray, though I'm not 100% sure. It gave just the look I was after though. 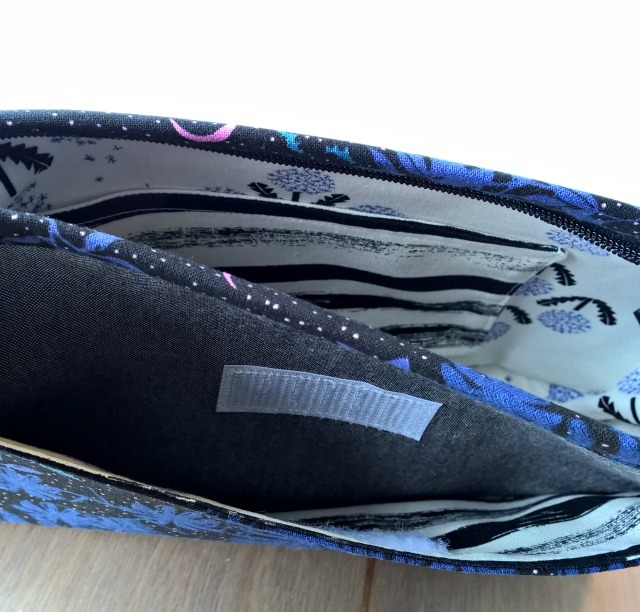 All other fabrics were Cotton + Steel - the dark blue/black on the exterior pocket and zipper binding is from the Honeymoon collection by Sarah Watts (same as mom's bag); the interior pocket and lining fabrics are both from Zephyr by Rashina Coleman-Hale. Mom chose them all from my stack of C+S, and I think they go really nicely together. It is beautiful. Nice job! such a pretty pouch, I really, really love all the fabrics your mom chose. Just gorgeous. Love it, Debbie! Svetlana has the most amazing patterns, doesn't she?! Another beautiful pouch, great job! This pouch is beautiful, I love the fabrics. It's going to be perfect with the bag. I really need to try one of Svetlana's patterns, I just can't decide on which one, they're all so nice.